To know if your Linksys adapter has been properly installed, check if the Linksys Wireless Network Monitor detects the wireless adapter and if the drivers were properly installed in Device Manager. 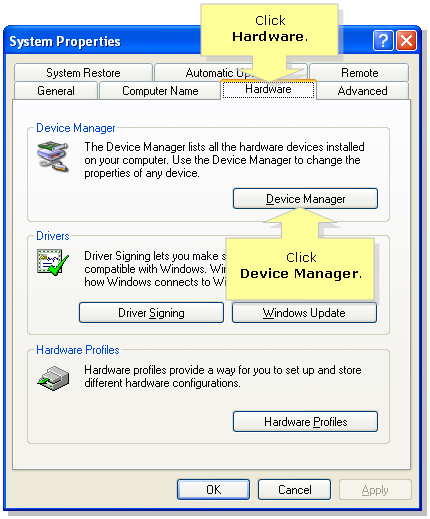 Note: Checking the drivers thru device manager is not an assurance that the Wireless Network Monitor is installed. You still have to check if the Wireless Network Monitor is installed. 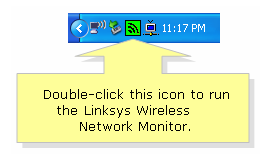 Double-click the Wireless Network Monitor icon at the bottom-right corner of your screen to show the Wireless Network Monitor. On the Wireless Network Monitor, check the bottom-right corner of the program should indicate Adapter is Active. Note: If the Wireless Network Monitor indicates Adapter is Inactive, click here to resolve it. 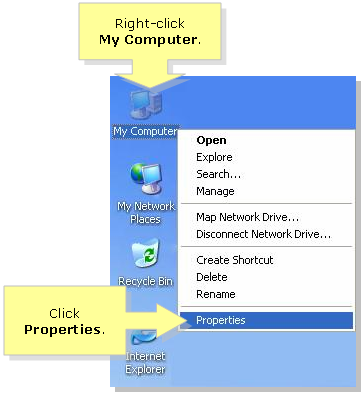 Right-click My Computer and click Properties. 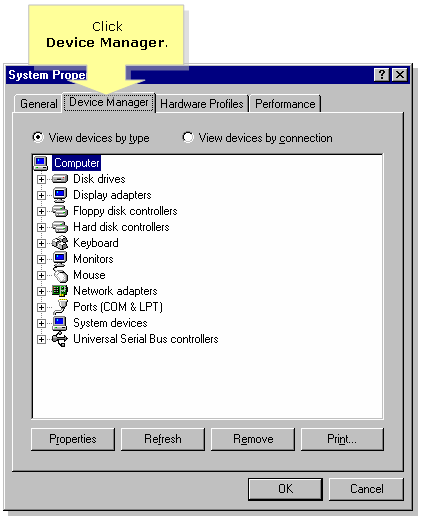 NOTE: If you’re using Windows 98 or ME click the Device Manager tab. 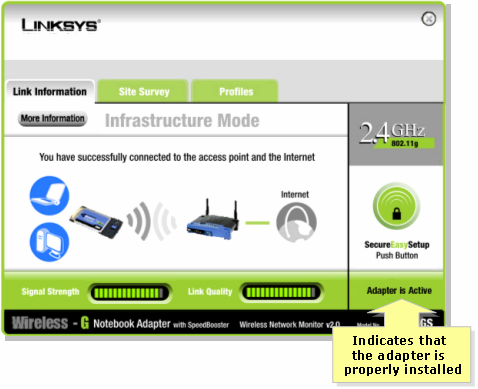 Click Network Adapters and look for Wireless-G Notebook Adapter with SpeedBooster. Take note if the Network Adapter icon: is colored green. If it’s green, this means that the drivers are installed properly. If the Network Adapter icon has a red x on top of it like this: this means that the device has been disabled. 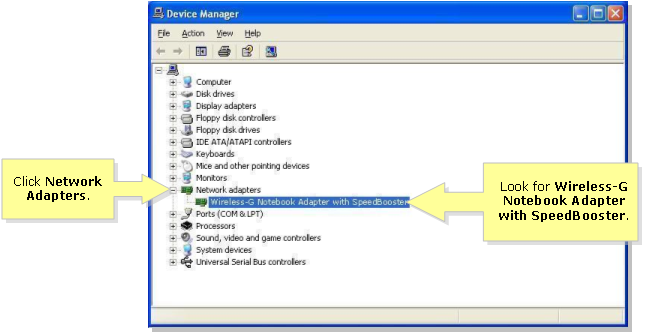 To enable it, right-click the Wireless-G Notebook Adapter with SpeedBooster and select Enable. If the Network Adapter icon has a exclamation point on top of a yellow circle on top of it like this: this means that the drivers are not installed properly. Click here for instructions on how to re-install the drivers properly. If re-installing the drivers did not work, you have to update the drivers. 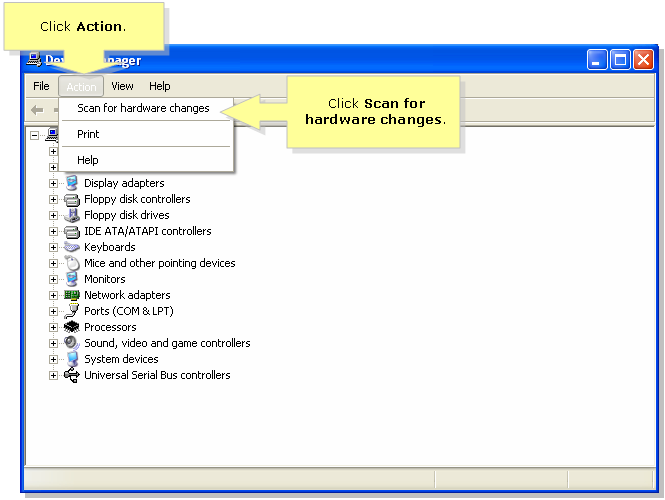 Click here for instructions on how to update the adapter’s drivers. If you don’t see the wireless adapter under network adapter, click Other devices and look for Ethernet or Network Controller. This means that the drivers have not been installed so you have to install the drivers. 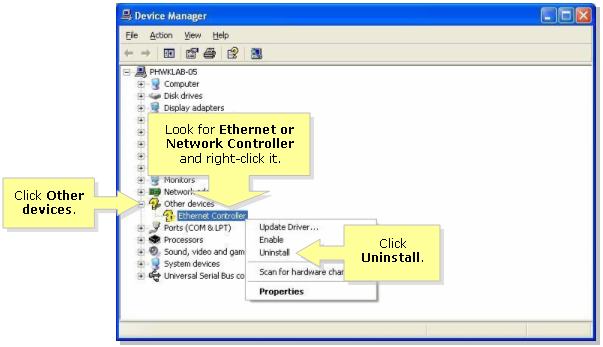 Uninstall it first by right-clicking on Ethernet or Network Controller then click Uninstall then install the drivers. If you still don’t see your wireless adapter under Network adapter or Other devices, click Actions and click Scan for hardware changes.